and died later in hospital. The death of a toddler from a heroin overdose may have been avoided if agencies involved with the family had recognised the risks, says a report. Daniel Jones, aged 23 months, collapsed at home in Penn, Wolverhampton, in May 2012 and died later in hospital. His parents, who were heroin addicts, have been jailed. Daniel's father was using heroin and has accepted he was responsible for the toddler somehow ingesting a tiny but lethal amount of the drug. The serious case review by the Wolverhampton Safeguarding Children Board found Daniel's death could not have been foreseen. But it said: "The full extent of the potential risks were not acknowledged by any of the practitioners and, had they been more professionally curious, had more respectful uncertainty and been more assertive in their approach to the family, Daniel's death may have been avoidable." The report made 44 recommendations. These include the need for improved partnership working, better communication between agencies and making sure practitioners have the right skills. Daniel had shared a bed with his mother Emma Bradburn and father Simon Jones. It is not known how Daniel came to ingest the heroin. The report said it was well-known the parents were drug users but this was not identified as a risk to the toddler. "Both were known to have used heroin and during the timeframe both were on a methadone programme prescribed by the Addiction Service," the report said. Alan Coe, chairman of Wolverhampton Safeguarding Children Board, said the death was "an absolute tragedy". "On behalf of Wolverhampton Safeguarding Children Board and the agencies involved in this case, I would like to offer an apology and express our deep sorrow to his family for the loss of a much-loved child," he said. Jones, 30, of Windsor Avenue, Penn, admitted manslaughter, while Emma Bradburn, 34, of the same address, admitted causing or allowing the death. 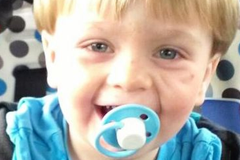 Sentencing, Mrs Justice Thirlwall said there was no doubt the two had loved their son.